Somehow I did it. After a two hour nap, I jumped in the car at 4am Wednesday and drove to LAX where I made my flight, connected with my friend the painter Fred Betz, and we found our way from the airport to Chateaus Ste. Michel in Woodinville and caught up catch up with the other wine bloggers on the WBC-or-Bust bus just in time for a lesson in food and wine pairing. 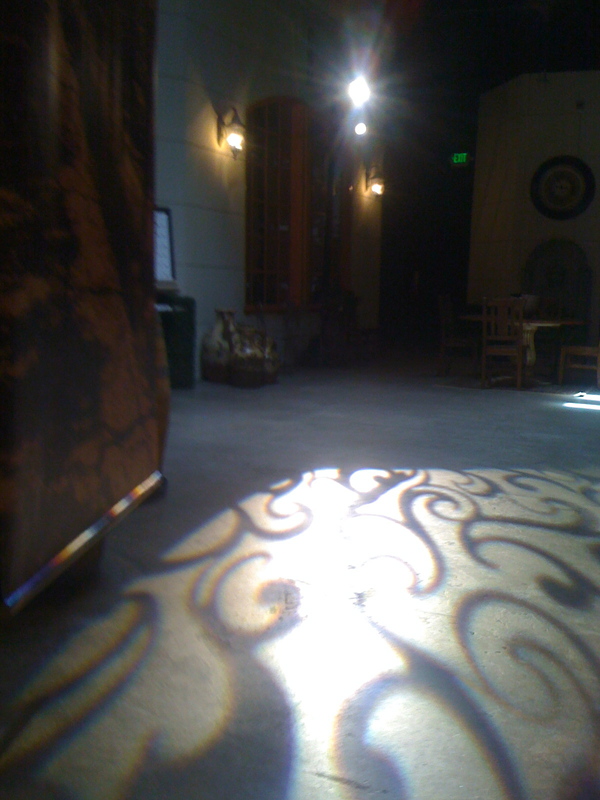 Pictured at right is the way the sunlight pours into the room leaving a pattern on the concrete floor. Needless to say, all of the food and all of the wines were fabulous.We started with four different reislings paired with Asian inspired cuisine, then four merlots with some manchego cheese and tender duck breast, and finishing with a late harvest riesling infected by the “noble rot” paired with a simple cookie and fresh raspberries. For more details about what I learned, and to see more iPhone photos, keep reading! Does L’Ecole No 41 Ring a Bell? Yes, L’Ecole No 41 does ring a bell in fact! A school bell too! 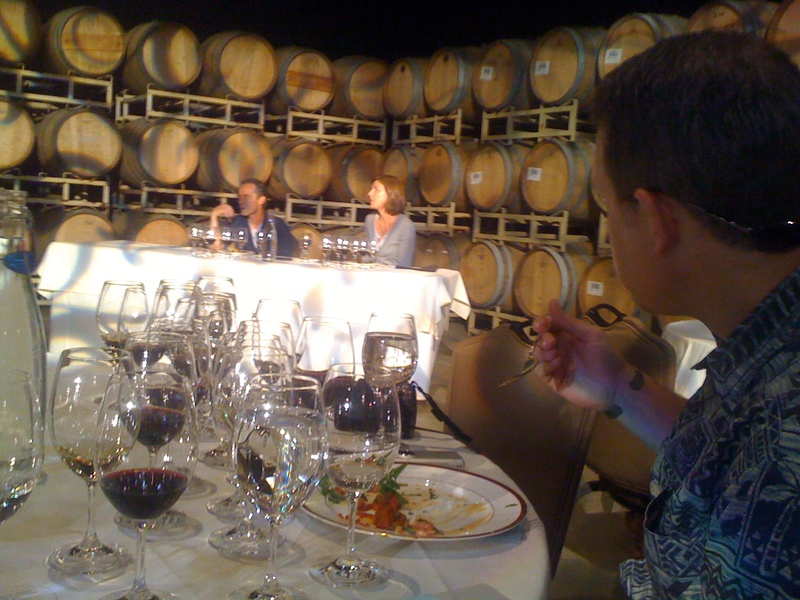 Last summer, in July 2009, I attended my second Wine Bloggers Conference in Santa Rosa California. During our last session, organizers announced that the third conference would be held in Walla Walla Washington the following June. To introduce us to Washington wines and inspire us to commit to attending, we had on our tables the very memorable and beautifully bottled Chateau Ste Michelle Eroica riesling, delicious and refreshing and summertime perfect, not too sweet and with plenty of acid to make it food friendly. I took an extra bottle home where it was a HUGE hit at our house with friends and my husband was truly wowed. We also had on our tables a bottle of L’Ecole No 41 merlot (available for $25 from the winery) which was equally memorable with its playful school house label and soft, gentle flavors of cherry and berry, nicely balanced and structured with tannins and oak. It was my first Washington merlot and I remember being surprised at how much I liked it. I brought an open bottle home from the conference and shared it with friends. So many seem to turn their noses up at merlot these days but I insisted they try it and we were all pleasantly rewarded. Yes, a few snooty California eyebrows were raised! Salmon & Washington Merlot? Really? Yes! 2010 Wine Bloggers Conference Scholarship Applications To Close Early! Because the 2010 Wine Bloggers Conference in Walla Walla Washington has filled up and sold out ALREADY, WBC scholarship applications will NOT be accepted until May as originally planned but closed a month early on Friday! Requested funds – please be specific, and indicate if you need the registration fee, full or partial hotel, full or partial airfare. Remember, that times are tough and a lot of people need assistance, so please be honest and realistic about your requirements. I am now working on my application in hopes that I will receive a scholarship and once again attend the fabulous Wine Bloggers Conference. I’d really like to learn more about Washington wines at the source–Washington! !–and share the experience here on Wine Predator with you as I did in Santa Rosa in 2008 and 2009 as well as in Lisbon 2009. How Will Extreme Walla Walla Washington Winter 2009 Impact Wines? One of the blogs I read about wine and wine related issues is Ken Payton’s Reign of Terroir. I met Ken at the 2009 Wine Bloggers Conference in Santa Rosa; we both took refuge under a shady tree during a tasting at Dry Creek Vineyard. We also ran into each other at the EWBC in Lisbon the following November and we both traveled to the cork forest. Along the way, I’ve learned that Ken is a blogger of the journalistic vein; he’s willing to ask the tough questions. He’s quick to take notes and record conversations of interest. He’s bright, articulate, edgy, and opinionated–and he has weighed in on comments here in this blog as well. The act of singular events like winter freezes are a little less extreme of late, but they still occur. Walla Walla this past December got down to 10 degrees; that’s at the damaging point for grape vines. Those kinds of things still happen. They just don’t go away. These extreme issues, whether they be with rainfall, hail even, of Winter freezes or Spring frosts, they are still risks to the industry depending on where you are. Should I win a spot on the WBC-Or-Bust bus, this topic will be something I will want to follow-up on: how climate change is impacting the wine industry in the Northwest and in Washington in particular. I’ve been curious about climate change since I was an undergrad environmental studies major at UC Santa Cruz (where I went following a stint working in Ridge’s tasting room and where we had as a test case Randall Grahm’s Bonny Doon Vineyards!) I wonder whether wineries will be willing to have front door conversations on this touchy subject. Certainly, the wineries should be prepared to discuss their sustainable practices and the ways they are reducing their carbon footprints. Word count clocks in at over 400! And I thought this would be a short and sweet post! What’s up for Wine Blogging Wednesday for March? Joe, at 1WineDude.com, hosts Wine Blogging Wednesday #67 with a theme of Seeing Red For the First Time. Here’s the link to his blog to read his complete announcement. Joe’s prompts us to “pick a red wine that you would use to introduce a white wine drinker to red wines for the first time. Think of a person that only ever drinks white wine, and answer the question: What Red Wine would I use to convince that white-wine-only person that they should also drink reds? Participate by posting a comment to 1WineDude.com on or before March 24. Include the link to your review. Dude, Pouring more red down the throats of white wine drinkers is like throwing a match on a forest fire, what’s the point and who will notice? I get sooo many knee jerk “I don’t drink white wine” whinges at tastings there is a greater good to be served. Expand consumers exposure to quality whites and the whole wine experience will be better for it. Tougher row to hoe but sooo much more satisfying. Saying that, very cool picture though. I have no idea yet what I’m going to write about but I certainly don’t think it’s a lost cause to offer the right red wine to a white wine drinker. Maybe something from a tasting last Sunday up in Santa Barbara County? Something from the NZ tasting last week? Maybe inspiration will come from the bottling at Old Creek Ranch Winery this Sunday? Maybe this weekend I’ll spend a little time in the cellar or rummage through the empty bottles and notes I’ve been saving to write about? What I should do, obviously, is choose a Washington red wine so I’ll have one more post up for the WBC-or-Bust competition. But that’s hard to do when I don’t know their wines very well. Because what I really think this takes is knowing the white wine drinker. What kind of white wines a person likes will tip us off to what reds he or she might like…That’s what I’m going to be contemplating over the next week. PS Happy St Patrick’s Day! I may have wine with my corned beef but what I’m really looking forward to is a black and tan and something Irish that starts with a “w”!